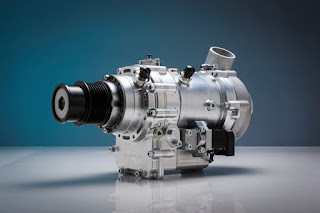 Torotrak Group claims it has verified its previous claims for V-Charge, a variable drive mechanical supercharger, using a Ford three-cylinder EcoBoost engine. In comparison with the incumbent fixed ratio positive displacement supercharger on a 1-litre GTDI engine, V-Charge achieved improved BSFC (brake specific fuel consumption), better transient performance and a maximum BMEP (brake mean effective pressure) of 31bar. Torotrak claims a V-Charge equipped 1-litre 3-cylinder EcoBoost engine has similar performance to a 1.5-litre 4-cylinder version, combined with improved driveability, despite a 33 per cent reduction in displacement. This signals the potential for a new level of downsizing, enabling the industry to further reduce the CO2 output of high volume vehicles without compromising driver satisfaction. By accurately and rapidly varying boost pressure independently of engine speed, Torotrak engineers say that V-Charge ensures the engine responds instantly to any driver demand. The optimum mass of air can always be delivered to the cylinders, at any engine speed, without any of the lag often associated with turbochargers. This remains true even at very low engine speeds where conventional boosting systems often struggle to deliver, according to Torotrak. The ability to control compressor speed on V-Charge independently of engine speed, allows parasitic losses to be reduced and the need to de-clutch is decreased. The use of a centrifugal compressor, instead of a positive displacement Roots type blower, reduces power consumption, improves efficiency and requires less package space. Packaging is also simplified by the quiet operation of V-Charge, dispensing with the need for soundproofing. Test results for NVH show the sound pressure of a V-Charge installation is up to 15.9dB(A) lower than a similar Eaton system with encapsulation, and 19.7 dB(A) lower than the similar Eaton system without encapsulation. Torotrak claims V-Charge is well placed to satisfy the first stage of boosting on the most aggressively downsized engines because it has a continuous air power capability of up to 17kW. It can also provide a flexible handover to the turbocharger at any engine speed, enabling simpler boost control. Though tested on a gasoline application, Torotrak anticipates that V-Charge will achieve similar gains on a downsized diesel engine. This Torotrak engine must be built on the CGI-blockversion from Brazil that you mentioned in July. The original version wouldn´t manage to handle amaximum BMEP (brake mean effective pressure) of 31 Bar.